The replacement filter cartridge for the deluxe filtering showerhead. It doesn’t matter which finish you have, this is the right filter. Chlorine is removed from 90 to 99%. 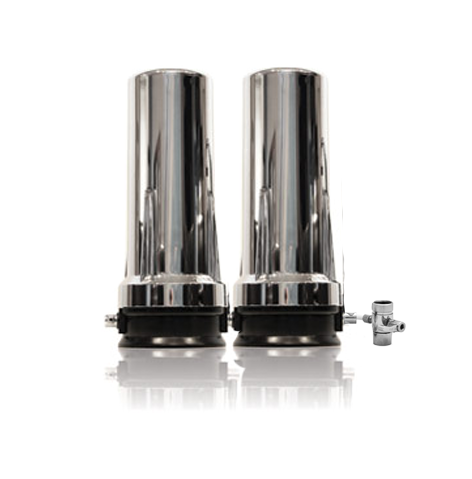 These showerhead filters have been NSF tested and exceed NSF Standard 177 for chlorine removal. Chlorine is the primary risk from showering and bathing. Please note: The primary risk of fluoride is from ingestion. Fluoride does not release into the air to be breathed in, like chlorine. Not is it readily absorbed through the skin like chlorine. For information on chlorine, click on: Chlorine. FILTER MEDIA FACTS: This filtering showerhead has granulated kdf material. It has a proprietary blend of regular and fine kdf 55.